In the 21st Century, Computing world has experienced huge demand and innovation in terms of development and technology. Many platforms have proved themselves as an important resource to make things easier for humans. In addition to the above, there are few technologies which are defining the path which is leading our generation to create its own era of innovation. Blue Prism is one of the latest technology which is helping enterprise companies to experience robotics automation in their work culture. 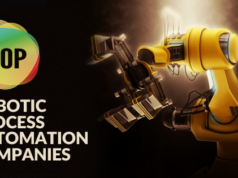 Also, there are few partner companies which are providing Blue Prism Certifications to learn about Robotic Process Automation along with key features of Blue Prism technology. In 2001, a group which was the expert of process automation founded Blue Prism. Their main focus was to enhance the effectiveness and efficiency of enterprise companies. They were also working for the improvement of organizations. Alastair Bathgate and David Moss originally co-founded Blue Prism Company with a goal of providing automation to the organizations. Their approach to developing these key features is called Robotic Process Automation. Blue Prism is fully owned by a UK MNC Blue Prism Group. Blue Prism helps organizations into high data work which is manually processed by providing robotic process automation software. A Blue Prism certification is the credential that validates and demonstrates one’s expertise in designing, architecting, developing, installing or configuring blue prism environment and applications. There are various Blue Prism Certifications which we have listed below in the table for reference. These certifications come under pre-defined criteria like they have a separate form of content which is likely to be covered by everyone who is interested. 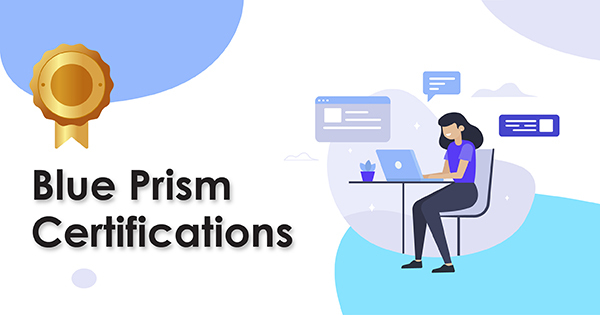 You can find below all the details like exam information, objectives, prerequisites, and registration process for the blue prism certifications. So, if you are aiming to learn Blue Prism and opting its certification but don’t know how to do blue prism certification, then you must go through this article once. Also, to know more about career opportunities in Blue Prism, you can refer to this article. Now, we will get the details of the blue prism certifications in detail. Blue Prism Developer Certification involves credential in development. Being at the associate level, it is one of the top blue prism certifications which consists of basic programs to learn along with the necessary tools and aspects of Blue Prism. Blue Prism Certification exam is available in three languages i.e. English, Japanese, and Spanish. The exam format consists of multiple choice questions and the duration of the exam is 60 minutes. The registration fee for Blue Prism Developer Certification exam is USD 80. If you are opting Blue Prism Developer Certification exam, then you will be an expert in basics of Blue Prism tools and Guides. 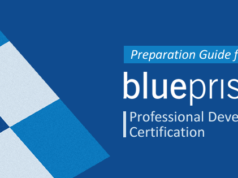 Blue Prism Developer Certification exam is available in the English language. The passing percentage for this exam is 70%. If you are opting Blue Prism Professional Developer Certification exam, then you will be an expert in the advanced level of Blue Prism Application, data type, and variables. Designing always plays a key role while learning any of the technology in the current era of IT world. Blue Prism has one key feature that it includes process monitoring and developing features. The Designing Blue Prism Process Solutions certification involves designing and solution process both. Designing Blue Prism Process Solutions Certification exam is available in the English language. The passing percentage for this exam is 70%. If you are opting Designing Blue Prism Process Solutions Certification exam, then you will be an expert in application designing, designing guide, and process solutions practice. An architect is responsible for the whole architecture of the process automation. Blue Prism ROM Architect Certification gives the architect recognition to the professionals. In this certification, one learns how to design the internal structure as well as its functioning. Even if you are not a technical individual or you don’t have a background in computer science, you can opt this certification as for Blue Prism ROM Architect Certification, there are no prerequisites. Blue Prism Process ROM Architect Certification exam is available in English. The passing percentage for this exam is 70%. If you are opting Blue Prism Process ROM Architect Certification exam, then you will become an expert in ROM Architecture. Designing a Blue Prism (Version 5.0) Environment certification exam validates one’s expertise in creating an environment for the automation process. An analyst who is an expert of designing environment in Blue Prism is responsible for workflows. In this blue prism certification exam, you will learn all the necessary tools which are used to create an apt environment for Blue Prism. Designing a Blue Prism (Version 5.0) Environment Certification exam is available in the English language. The passing percentage for this certification exam is 80%. If you are opting “Designing a Blue Prism (Version 5.0) Environment” certification exam, then you will become a Technical Architect. Designing a Blue Prism (Version 6.0) Environment Certification exam is an advanced level of the Designing a Blue Prism (Version 5.0) Environment certification exam. You will learn all the exact same key aspects which we have mentioned above. In this certification exam, you will learn advanced tools which are helpful to create an appropriate environment for Blue Prism. Designing a Blue Prism (Version 6.0) Environment Certification exam is available in English. The passing percentage for this exam is 70%. If you are opting “Designing a Blue Prism (Version 6.0) Environment” Certification exam, then you will get an accreditation of the Technical Architect. Installing and Configuring a Blue Prism (Version 5.0) Environment certification exam consists of installing and configuring all the process initiated by Blue Prism. It also consists of necessary tools in which you can learn how to install and configure Blue Prism applications. Installing and Configuring a Blue Prism (Version 5.0) Environment Certification exam is available in English. The passing percentage for this exam is 70%. If you are opting “Installing and Configuring a Blue Prism (Version 5.0) Environment” Certification exam, then you will become an Installation Engineer. Installing and Configuring a Blue Prism (Version 6.0) Environment certification exam is an advanced variant of the previous exam. It consists of advanced tools which are useful in installing and configuring all the process. Installing and Configuring a Blue Prism (Version 6.0) Environment Certification exam is available in English. The passing percentage for this exam is 70%. If you are opting “Installing and Configuring a Blue Prism (Version 6.0) Environment” Certification exam, then you will become an Installation Engineer. Note: A blue prism certification costs different in a different country. Here we have mentioned the exam fee in the United States (US). The exam registration is an important part of the blue prism certification process. The registration for all the certifications comprises of the same steps for which some important information is required. The companies which are associated with Blue Prism can only give the certification. Create a valid account on the blue prism website and get Blue Prism Portal ID. Create a web account on the Pearson VUE with your Blue Prism portal ID, First name, and Last name. Choose exam location, testing center, and timing schedule for your exam. And you will get a confirmation mail from Pearson VUE with your exam date, exam time, directions to the test center along with phone number and address. In this continuous developing technology world, the organizations need the best resources to drive robotic process automation successfully. And for this, they prefer to hire certified professionals who are skilled to perform their job very well. Although it is not mandatory to get certified it makes you stand out of the crowd in this era of competition. And so, it helps to enhance one’s career with better job offers and salary packages. In this article, you have learned how to enhance and validate your skills while learning Blue Prism technology. Also, you have got to know the impact of top Blue Prism Certifications on the IT Industry. After reading the above information, you must have got the answer of many questions like how to do Blue Prism Certification, Blue Prism Certification Process, and Blue Prism Certification preparation. You can learn this technology through online training and hands-on practice on the blue prism platform. And to prepare for the certification exam, practice tests will be an important resource. 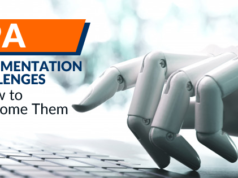 To help you in your exam preparation, Whizlabs brings practice test series for Blue Prism Developer Certification and Blue Prism Professional Developer Certification that will make you ready to pass the exam. So, join us today to become the certified blue prism developer in the future. So, this is all about the Blue Prism Certifications. If you have any queries or doubt about any of the Blue Prism Certification, you can put a comment below. We will be happy to answer your queries.